A thoroughly versatile headset that adapts well to the needs of modern gamers. While not perfect, you’ll struggle to find audio and features this good in any other similarly-priced cans. Creative has a rich history in audio, dating back well into the ‘80s when they supplied soundcards for monolithic, beige PC towers. Fast-forward to 2019, and the Super SXFI Air represents the company’s latest entry into the audio arena - a headset that boasts 7.1 audio, headphone holography, wireless functionality and a bunch of other fancy features. It’s most definitely a pair of cans stuffed to the brim with technology, but does it manage to bring everything together in a great value headset for gaming? In essence, yes. And while not perfect, there’s loads more to love here than just the features listed on the box. It’s worth noting that this headset is compatible with PS4, PC, Switch and mobile devices but not Xbox One. The first thing you notice is that the Super SXFI Air is a neatly designed headset with a classic look. While it’s mostly shades of black (or white - we tested the black), there is some subtle lighting around the earcups that glows when the unit is powered on. You can even change the colors if you like, although you don’t see the result yourself unless posing for a headphone selfie. If real human beings actually do that kind of thing. 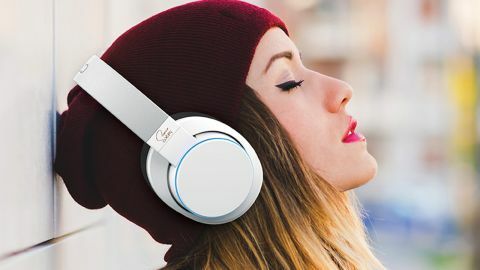 There are control buttons along the side of the earcups (which are a little too easy to hit accidentally) and a touch-screen for skipping tracks while you’re connected to mobile devices via Bluetooth. Less handy for gaming, but cool, and they actually work most of the time too. The downside is that these headphones are bulky. Paint them green and wear a smoking jacket, and you can pull off a convincing impression of the Prince from the Katamari games. While style matters less, especially given how lightweight they are (11.9oz / 338g), it’s something to consider if you’re taking the headset out and about. Which you absolutely should do, as this is a headset that comfortably handles gaming, movies, TV, music, phone calls and anything else you throw at it. It’s one of the most versatile bits of tech we’ve ever tested. The other negative in the design is the headband, which is stingy with the padding, so it does noticeably press down on the top of your head after about 30 minutes of use. The earcups, meanwhile, feel delightfully soft for hours. Let’s start with the headphone holography. The Super SFXI Air claims to tailor sound specific to your head and ear shape, and you can create a profile via a phone or PC / laptop by taking pictures of your own head. Better to let a friend do it, actually. I tested this by creating my own profile, and then making one for a couple of friends too, to see how the audio changed. While there were a few subtle differences, it really wasn’t all that noticeable, so I definitely wouldn’t recommend buying the SFXI Air based on this alone. Set-up wasn’t too easy either, and required a bit of juggling between phone and headset to get everything working. However, the sound it did produce with SXFI enabled is wonderfully rich, especially for music, as it does a great job of recreating true 7.1 sound inside a headset environment. More on that later. Elsewhere, the wireless tech is solid if unspectacular. I still had artifacting and wireless signal loss inside busy locations when paired with several devices (Samsung Galaxy S9 and iPad 2018), but it holds up well generally and connects quickly. Battery life is around 8 hours, slightly less if you're using features like the touch controls frequently. Plugging in via the 3.5mm jack creates solid audio, although you’ve then lost the ability to use all the headset’s fancy control features. Finally, the Bluetooth mic that comes with the headset isn’t game-compatible, so you’d need to buy a separate mic (which Creative sells online). We tested with the gaming mic, which literally just plugs in, and it works really well. A simple solution, although the addition of cost is irritating if you’ve already sprung for a headset. This is where the SXFI Air really excels. All claims about head-mapping aside, the way the headset recreates a multi-speaker set-up using holography is genuinely impressive - you notice a huge difference. During games of Assassin’s Creed Odyssey the SXFI Air captured not only the incidental details of the world and the booming action noises, but it was also able to accurately convey the nuances of the dialogue without me having to tweak a single pre-set. The game’s soundtrack comes through especially well too; no surprise when the SFXI Air handles other music so competently. On to Battlefield 5, and again the 50mm drivers do a great job of presenting the bassy booms of war. The headset’s virtual 7.1 surround means that you know where the bullets are whizzing from, and the SXFI even manages to pull out subtle sound queues like footsteps and shouted commands from the busiest of conflicts. It’s what you’d expect from a headset of this price, but comforting to know that it can handle louder, more brute-force audio. Battlefield provides an opportunity to try out the peripheral mic, which holds up well, if unspectacularly. I did get a chance to test the included Bluetooth mic with phone calls and video calls, and it works just fine. During testing, I also tried the SXFI with Life is Strange 2, Gnog, and Shadow of the Tomb Raider - and it adapted perfectly regardless of what was thrown at it. This is a seriously versatile pair of cans, perfect for gaming, especially if you’re staying away from titles that require communication. What’s especially good is the noise exclusion. While there’s no special noise-cancelling feature, this headset blocks out as much ambient noise as my Sennheiser Momentum 2.0s, which are more expensive, specialized audio headphones. It’s quite a feat. Finally, I tried it with a handful of movies and TV shows. Unlike many other headsets, the SXFI manages to cope with quieter dialogue scenes without sounding tinny like you’re watching from inside a steel box, and it ramps up well for explosions and chaos. The Punisher on Netflix is a perfect test for this, as is Star Trek Discovery. It also handled several Marvel movies well. Music-wise, the SXFI is a brilliant performer. Tested with metal, hip hop, pop, classical and podcasts, it did a fantastic job of recreating a proper audio set-up, rather than a bassy simulation of sound (that most other gaming headsets provide). It actually performed best with singer songwriter music, so Ed Sheeran fans will be delighted. I am not one of these. At $180 / £150, the SXFI Air isn’t cheap. It’s a great wireless headset, however, and one that you can easily use for all aspects of your digital life. In fact, it’s a slightly better audio and movie headset than a gaming one. If you’re looking for a pure gaming headset, this delivers good audio for the price you pay - not quite the absolute best, but very much what you’d expect for the money. However, because it’s so versatile, the SXFI Air becomes a real recommendation - it can handle everything you throw at it. Even Ed Sheeran.